Introducing Howard Beck’s historical account of adventure and exploration in one of the world’s last remaining wild places: the primordial jungles of Papua New Guinea and the strange realm of the caverns that lay hidden beneath them. New Guinea is one of the world’s great karst destinations, and this rather splendid book covers the whole story. Howard Beck has done a great job of gathering and filtering a mountain of data to produce a very readable account that creates a very fair picture of the New Guinea caving scene. His text alternates between straight accounts of exciting underground explorations, human stories of individual experiences and almost poetic descriptions of the uniquely hostile environment of the New Guinea forests. Perhaps over-poetic an a few places, but how else does an author describe this alien terrain of aggressive insects, hostile vegetation, horrendous rainfall, trackless forest and nightly frosts. Your reviewer thoroughly enjoyed reading the entire book, and remains in awe of the cavers who ventured into this awful place more than once. The caving honours were divided between nations, but Howard Beck covers them all. The Brit’s expedition in 1975 was a classic of truly remarkable exploration both above and below ground – such a shame that most of the caves were horrible (except Seminum Tem, which remains a New Guinea big one) and the surface conditions were mostly dreadful (and how sad that Era Tem was so short at the end of that spectacular climb up the Hindenburg Wall a few years later). The Australian cavers had dabbled in their backyard island previously, but only got going in the late 70s, when they turned up the dramatic river passages of Atea and then the long and deep maze of Mamo – providing stories galore of sheer excitement and dramatic escapes. Third on the scene were the French, and they hit the jackpot with their bold explorations of the giant river caves beneath the Nakanai Mountains on the offshore island of New Britain – Nare is perhaps the world’s classic pothole (though it took a team of Derbyshire fruitcakes to reach the sump), and Muruk broke records with its long river-passage through-trip 1178m deep. The huge underground rivers of New Britain represented a big step forward in the standards and techniques of cave exploration (which has still not been matched elsewhere). Great caves, fantastic karst, and also great characters emerge from the pages. Kevan Wilde, the wild man from Oz who achieved so much in the early years. Tony White, that supremely competent Brit, whose name keeps appearing and who found so much cave on his own. Julia James (half Brit, half Ozzie) who achieved her lifetime target of pushing deep in New Guinea. Jean-Paul Sounier, whose name perhaps stands out from a swathe of extremely hard French cavers. And how can anyone not warm to an indigenous people whose pidgin language term for a helicopter is “mixmaster bilong Jesus”. Perhaps the years have created a bias, with less detail on the 1975 Brits than on the later French. But overall the book works, where Howard Beck quietly paints pictures of local people and fine cavers, with welcome splashes of anecdotes and personal recollections (though he omits that classic comment from Julia James that she would have “no more women on her expeditions”). Alongside its fine text, this book is superbly illustrated. Excellent cartography in 31 maps (though some key names in the text are missing from surveys, and many surveys are rather distant from their text pages). And the photos are fabulous (with typical Speleo Projects high quality); lots of photos of the local people and forests of New Guinea mainly by the author, but then lots of underground photos provided by all the main expeditions to cover all the great caves. The author has gathered his material well. And the end result is a great book. This should stand the test of time as one of the classics of caving literature. The wealth of information and the hundreds of photos make it a very good value. Every caver (and many an adventurer or serious traveler) will want his own copy, and will gain a lot of both enjoyment and inspiration through reading it. Pick up Howard Beck’s book – that’s the Howard Beck who wrote Gaping Gill. 150 years of exploration – and the sheer quality of it will impress you. The paper quality, the print quality, the reproduction… This is a fine volume indeed, as is to be expected from its publisher, Speleo Projects, let alone Howard as an experienced researcher and author.No doubt you will flick through the photographs, spotting the extensive colour spreads in eight groups, and perhaps begin to read. That’s it; if you have any interest in the lure of the unknown and expedition caving at the extreme margins where any error is a serious one, you’re hooked. 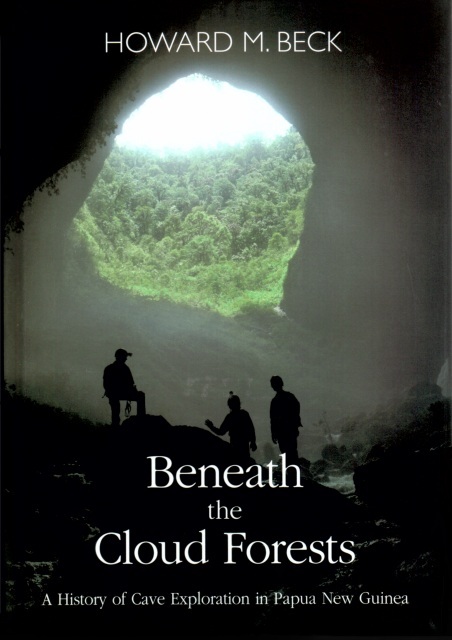 Beneath the Cloud Forests is the history of exploration in the caves of Papua New Guinea. In it, Howard has not attempted to cover every expedition and its highlights and failures; rather, he concentrates on the shift from deep cave exploration as being the preserve of the French, to the quest to find the deepest cave in the world on the other side of the globe. Here, then, are the landmark discoveries and human disappointments, told as a history of pioneering accomplishments against the backdrop of dense forests, roaring rivers and the mysteries of soaring mountains. Older cavers will remember PNG names with awe from early reports in Descent, such as Selminum Tem, Atea Kananda, and the boiling waters of the Nare. More recent converts to our sport–you are set for a treat as you learn for the first time what it was like to tackle some of the hardest caves on the world. Do not expect a dry retellling of facts and figures; rather, begin with Fernand Petzl’s descent of the Gouffre Berger in France and the subsequent drive to pass beyond 1,000m depth, and how this helped fuel British motives to seek fortunes further afield.. It was part of a diverse, burgeoning interest in hunting out the caves of PNG. Even if you have heard of places such as the Nare’s Apocalypes Now, and recall how this monstrous rapid waited to lure cavers into its depths, it is the detail of how it was found and the attempts to pass it that will fascinate any caver. Grappling iron launcher to the fore…bolting across the ceiling…and that was only the beginnings of ‘unusual’ approaches (and where else might you inspect a cave entrance using a helicopter?). In Muruk, experience the effort it took to rig 2.1 km of rope to reach the then terminal sump at -637m – and dive it to stroll down wide river passages. Muruk eventually connected with the Bérénice system, which produces a through-trip and took it to 1,1,78m deep – the first system in the southern hemisphere to attain the goal that the early explorers had dreamed of: the magic 1,000m did indeed exist in Papua New Guinea. Along the way, Mamo Kananda was taken to 54,8 km. Is the book perfect? No, but what is? Spotting a number of typographical or layup errors, or ‘incorrect’ words (such as ‘sight‘ for ‘site’), is relatively easy, and some of the maps lack enough detail to enable a good link with the text, but this does not detract from offerring Howard congratulations on taking up the challenge to research and write a superb tale of endeavour. Buy this book now, for it is destined to be a classic and required reading for any self-respecting caver; you might as well give in early, rather than wait for Christmas.